Garlic leaves taste a lot like leeks, with a more intense garlicky and spicy flavor. We usually use them in stir-fries. I personally consider garlic leaves pair best with pork belly in stir-fries. They help to get rid of mild hog flavor in pork belly, and add refreshing herbal spicy garlic flavor to the whole dish. Pork belly I use here has been marinated, smoked, briefly soaked and then stir-fried in a wok. All the extra effort pays off in the end. 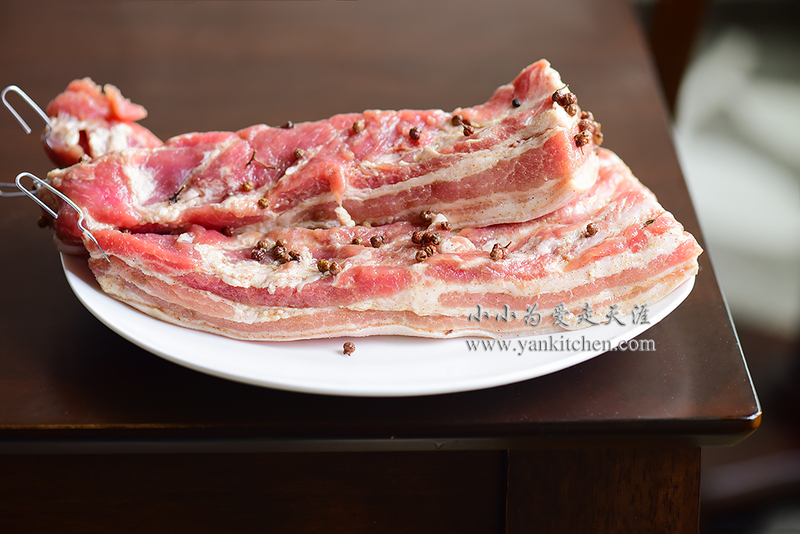 With a sharp knife, cut the pork belly into three thick slices. Add Sichuan peppercorns, thirteen spices powder, sugar, rice wine and salt. Rub the spices on to pork belly. Cover with lid or plastic wrap. Refrigerate for a couple days. I twist some stainless steel paper clips to hook pork belly onto smoker racks. Smoke for about 2 hours. Pork belly turns to beautiful golden amber color. Please remember to tightly hook up the meat. One of the three pieces slips off and half of it is burnt before I realize it. When the smoked pork belly has been cooled down, we can slice and stir-fry it. Clean and rinse the garlic leaves under running water. Cut into 1 inch pieces. They look and taste similar to leek, just smaller sized and come with a stronger flavor. With a sharp knife, thinly slice the pork belly. If they are too tough to slice, soak them in the water for twenty minutes. That will help. Heat a cast iron wok over high heat. Add oil, and then Sichuan peppercorns and chili peppers. Sauté for 1 minute. Add pork belly. Stir fry for several minutes. Pork belly turns golden brown. Add garlic leaves, along with oyster sauce, soy sauce, sugar, Pixian chili paste and salt to taste. Stir fry until the garlic leaves turn into deep dark green color. That means they have been cooked through. Once they are cooked through, garlic leaves’ flavor become mild and sweet. The dish is served in a cast iron shabu pot. I use a Staub universal base with a candle or fuel burner inside to keep the dish hot through whole dinner time. Pork belly taste best when they are hot. Compared to the non-smoked version, smoked pork belly packs richer, more complicated flavors. And the texture is pleasantly al dente.